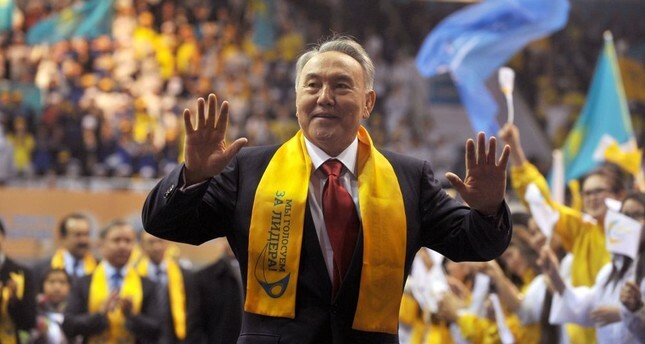 Nursultan Nazarbayev: Last Soviet leader or Kazakhstan's founding president? Kazakh President Nursultan Nazarbayev greets his supporters during a celebration rally at a sports center in Astana, April 4, 2011. Kazakhstan's President Nursultan Nazarbayev announced on Kazakh state TV on March 19 that he will resign as president. In 1989 he became the First Secretary of the Communist Party of Kazakhstan; then after independence, he became the founder and first president of the country. Thus, he is both the last leader left from the Soviet era and the longest-serving head of state among post-Soviet leaders. For that reason, more than half of Kazakhstan's population has not seen any leader other than Nazarbayev. The Kazakh nation was one of the most affected nations by the Stalinist Soviet regime. The nation lost one-quarter of its population because of the man-made famine of 1930-1933. Nazarbayev, who was born after the famine, was in the first wave that felt the result of the famine. He saw that Kazakh people became a minority in their own land. The first mention on Nazarbayev in the Kazakh media goes back in 1961 when he was still a student in Karaganda. Under Dinmukhammed Kunayev's leadership, the Kazakh Soviet Socialist Union Republic had promoted Kazakh young people to have high governmental positions. Nazarbayev was one of the bright young Communist Party cadres who benefited from the korenization (nativization) policy of Kunayev and rose to a high governmental position quickly. The 1990s were a difficult decade for the Kazakh people and the Kazakh state. Nazarbayev more or less successfully led the country to survive without significant upheavals. Economic crises, socio-economic problems and ethnic conflicts were common among the post-Soviet states in that period. So he ultimately saved his nation from the tumultuous time of the 1990s. Nazarbayev as the founder and first president of the country impacted the lives of a whole generation who grew up under his leadership. Under his leadership, the country transformed from centrally planned, state-owned and managed Soviet economy to a relatively free market-based economy. Some areas of this transformation were successful such as internationalization of the hydrocarbon sector which helped make Kazakhstan the wealthiest Central Asian republic as well as providing international education (with Bolashak program) for the next generation, however; some other areas are not as successful as the majority of the Kazakh people expected, such as the dealing of socio-economic problems of poor people. Foreign policy is an area where Nazarbayev is considered successful. He has worked hard to maintain a "multi-vector foreign policy" which is based on the delicate balancing of relations with Russia, China, the United States, Turkey and Europe as well as neighboring countries. Furthermore, Kazakhstan has become one of the essential transition countries for the "Belt and Road" initiatives and the primary connectivity hub in Central Asia. As the leader of Kazakhstan, he also pays attention to his country's international prestige. Kazakhstan became a temporary member of the U.N. Security Council, and he chaired different international and regional organizations and some of the Kazakh diplomats, like current interim President Kassym-Jomart Tokayev, who was the Deputy Secretary-General of the United Nations, have held high positions in different international organizations. Even though Kazakhstan has tried to keep good relations with all countries, sometimes it has had a difficult time with some major countries, such as with Russia on granting the United States access to Caspian ports for carrying nonmilitary goods to Afghanistan, with China on the detention of Kazakh nationalities and with Uzbekistan on border trade. He is considered by most of the political elites in the Turkic world as an Aksakal (a wise elder statesman) of the Turkish people. At the beginning of his leadership in the early 1990s, he tried to keep unity among the former Soviet Union republics. As time passed, he concentrated on the nation-building of the Kazakh people and state-building of Kazakhstan, so he began to highlight the history of broader Turkish people. He initiated the establishment of the International Turkic Academy in Astana. He has also encouraged Kazakh historians to rewrite Kazakh history based on common Turkish identity. Furthermore, almost a century later he renamed South Kazakhstan's Oblast as "Turkestan" again. Under his leadership, Kazakhstan and Turkey have developed close and trustworthy relations. His personal relationship with different Turkish leaders (from late Turgut Özal to President Recep Tayyip Erdoğan) has played a significant role in the development of cooperation between the two countries. He raised the issue of having Turkey as a member of the Eurasian Economic Union and supported Turkey's dialogue partner status in the Shanghai Cooperation Organization. Coordinating with Turkish leaders, Nazarbayev proposed and implemented a regional mechanism in Asia, called the Conference on Interaction and Confidence-Building Measures in Asia (CICA) which aims to establish confidence-building measures and co-operation in the Asian continent. Between Turkey and Kazakhstan, the Strategic Partnership Agreement signed during the visit of Nazarbayev in October 2009 deepened the level of strategic partnership. In addition to that, the Nakhchivan Treaty was signed with the efforts of Nazarbayev and Erdoğan in the same year and the creating organization of the Cooperation Council of Turkic Speaking Countries. Moreover, after the July 15, 2016 coup attempt Nazarbayev was the first leader to visit Turkey to support the Turkish government on Aug. 5. Nazarbayev also played an active role in preventing the growth of tensions between Turkey and Russia after the Russian warplane was shot down on Nov. 24, 2015. Nazarbayev was one of the mediators who calmed the Russian side, as well as decreasing tension and then finding a solution to the problem. In addition to that, Astana hosted Russia, Turkey and Iran to prevent fighting between these countries and find a common solution for the conflict in Syria. The leadership transition in countries like Kazakhstan, which has never experienced it before, is complicated. However, Nazarbayev has done a good amount of groundwork to ensure that the power transition is smooth. He has started to plan a transition several years ago. In 2017 Nazarbayev initiated changes in the constitution, decreasing the power of the president and in July 2018 extending the role of the Security Council, which Nazarbayev chairs, giving it control over all security forces and foreign policy. Since last year he also changed the government, presidential and security officials. Since 2010, Nazarbayev officially recognized the status of Elbasy (leader or founder of modern Kazakh nation and state), the First President of the Republic Kazakhstan. This is a version of a so-called "president mentor" or "minister mentor" model, copied from Singapore as Lee Kwan Yee did. Singapore is considered by Nazarbayev and the other Central Asian leaders as a good example in terms of transition and development. So despite his resignation, Nazarbayev seems to retain the real power behind closed doors. As set out in Kazakhstan's constitution, Speaker of the Senate Kassym-Jomart Tokayev took an oath as interim President on March 20 and will remain in the post until either scheduled presidential elections in December 2020 or earlier if he calls it. So he has become the second president in the country's independent history. Tokayev started serving in Nazarbayev's Cabinet in 1992 and has a remarkable resume of government service both domestically and abroad such as being prime minister, speaker of the senate, foreign minister as well as a deputy secretary-general of the United Nations. He is one of the most trusted and closest officials to Nazarbayev and is unlikely to pose a challenge to Nazarbayev's de facto control over the country in the near future. He indicated his allegiance to Nazarbayev and has pushed a resolution through parliament to rename the capital city of Astana to the city of Nursultan. Nazarbayev leaves his successor a country which is still processing its nation and state-building at the same time. On the one hand, Kazakhstan is in a very auspicious position in being a member of the international community, in establishing a very delicate balance among major powers, and the wealthiest state among the Central Asian countries. On the other hand, the country depends on hydrocarbon resources more than technological products, and has heightened socio-economic problems, which are difficult to solve in the short term. In conclusion, his decision to voluntarily step down from the presidential position might prove his most significant contribution to his country and to a region where previously a change of leadership has occurred only through death (Saparmurat Niyazov in Turkmenistan and Islam Karimov in Uzbekistan), revolutions (Askar Akayev and Kurmanbek Bakiyev in Kyrgyzstan), or other major political upheavals (civil war in Tajikistan). The other Central Asian leaders, as well as Russia's President Vladimir Putin, are closely watching this power transition process to see whether it goes smoothly or not. By stepping down of his own will, Nazarbayev could set a new pattern for Central Asian transitions of power. Although it is certain that Nazarbayev has not left power and politics, it is a sign that his era is ending. However, his legacy will continue to shape the future of Kazakhstan.